The Year of New Editions isn't just for English games. No, any game in any language can be getting themselves a new edition. Take Totenstadt, for example. 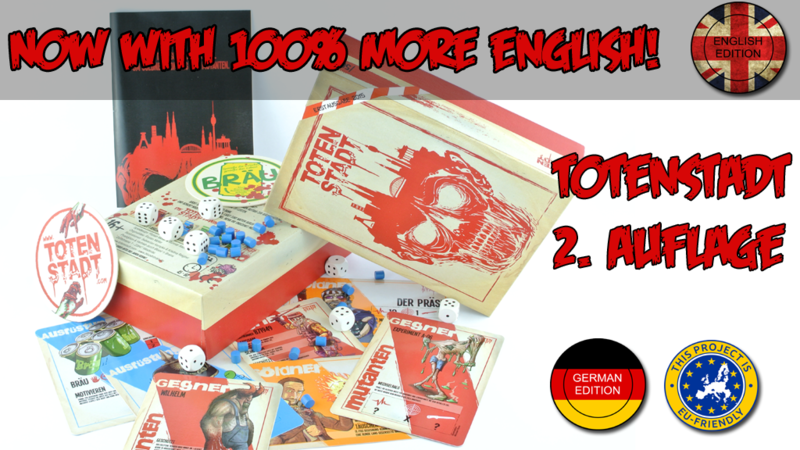 The game, originally published in German, is getting a second edition. This time around, those of us that speak English can get in on it, as they'll be making a version in that language, too. They're up on Kickstarter now. Those of you headed to Spiel will be able to check out some of the English versions of the cards while at the show. The group hopes to have the version done as quickly as possible, but they're not very great with their English, so they'll be getting a native-speaker to hopefully help. Other than that, the game will be identical to the German version that comes out. It might take a little longer to get sent out, though. But they hope to have it done by November/December. The campaign's about 1/3 funded with still 14 days left to go.